One of my favorite unplowed sections along one of the many @MDSHA roads. With the map above, I filled in sections of road that went unplowed for about a week after the 2016 Snowzilla storm. I'm only highlighting the westbound direction, but there were also lanes missing from the eastbound direction. As you can see by the graphic, the two exit lanes from US-29 South to Johns Hopkins Rd westbound disappeared as soon as the ramp ended. 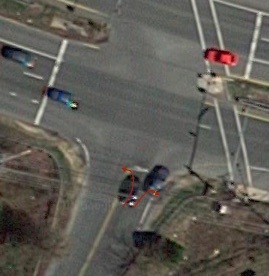 Also the dedicated left turn lane that is protected by a cement curb was also unplowed. With the latter, this meant that the signalized left turn would never activate since vehicles could not be present and therefore could not be detected. For vehicles turning right onto Montpelier Rd, they needed to merge to the middle through lane and then make a right around the pedestrian island when they would normally have a large radius non-stop turn. So here we have a road designed with essentially 5 lanes westbound with one dedicated right and one dedicated left turn and 3 through. With this snow pack on the road, it was reduced to two combination lanes (a yielding left turn/thru and a right/thru lane). Did the reduction in lanes affect the LOS (a measurement used by the SHA as standard practice to determine how many lanes to build)? We must remember that schools were canceled all week and OPM allowed liberal leave or late start times, but most people were back at work by Thur/Fri, with OPM starting work on-time Friday. The rush hour traffic moved smoothly through this area and nobody had to wait extra light cycles to navigate through this intersection. Is this road overbuilt? Probably. Can the extra lanes be changed into protected and separated bike lanes? Yes, with the enormous amount of space available by just one 12-14 FT wide lane, wide bike lanes with wide buffer protection would be absolutely possible. The buffer could be large planters that would offer a great deal of protection, although many other options exist. Do you know of other roads that handled traffic at an acceptable LOS while a lane or two was covered with snow?